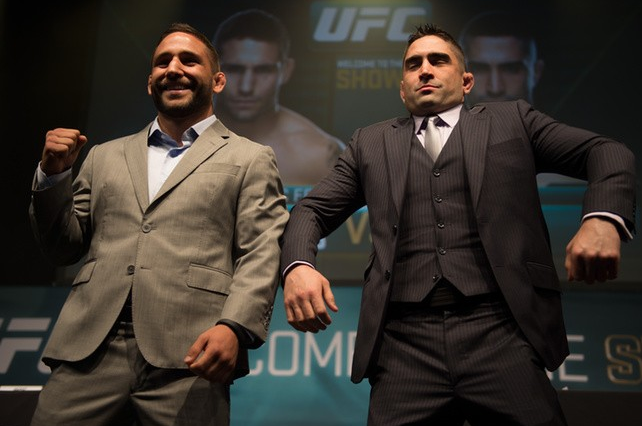 UFC takes over Fairfax with a huge main-event featuring Ricardo Lamas and Chad Mendes. Here is the full preview and breakdown for the night. Striking Advantage: Poirier definitely has the striking advantage in this one. Although Poirier isn't the most technical fighter, he still throws solid strikes with good power. He has hard leg kicks and a nice overhand left. Ferreira is very rudimentary in his standup, as he is still learning the in and outs of the striking game. He struggled on the feet against Dariush who is also a southpaw like Poirier. He did finish vet Ramsey Nijem at UFC 177 but that's mainly due to Ramsey's rushing in style and that his chin is always up in the air. Poirier has the tendency to be super aggressive at times which can lead him to getting countered and rocked, but I don't think Ferreira has the power to rock Dustin. Grappling Advantage: Based on credentials alone Ferreira has the edge on the mat as he is a 3rd degree bjj blackbelt, but Poirier has submitted black belts before. He is the only fighter to win 2 fights by d'arce choke and loves to attack with that submission when he gets on top. Ferreira showed he can be controlled and nullified when on his back by Dariush. In straight submission abiltity Ferreira should have the advantage, but Poirier can hold his own on the ground and be fine. Breakdown: This is Poirier's return to the 155lb division as he claims the cut to 145 was too drastic for him. Ferreira had a lot of hype coming into the UFC and solidified it with an amazing debut and a tko win over Ramsey Nijem, but coming off a loss he needs to stay on track in the deep 155lb division. Poirier has fought the best of the best at 145 and a win for Ferreira would be huge for his career. An impressive win for Poirier can put him right into the pack at 155. In this fight, Poirier has to be really careful on the ground or in scrambles, but if this fight does hit the ground Poirier is skilled enough to be safe. If it stays on the feet Poirier should have a considerable advantage. Striking Advantage: Peralta throws big power punches and haymakers, and Guida has good movement but he lacks in the power department. Guida just uses strikes to set up takedowns. Peralta definitely has the advantage on the feet, but he has got to be ready for Guida too shoot under his punches and look for takedowns. Grappling Advantage: Guida has the edge on the mat rather easily. Peralta's weakness is the ground game and he is coming off a 1st round submission lost to Thiago Tavarres. Guida has outgrappled some of the best at 155 and has excellent wrestling. Breakdown: This is a huge fight for Peralta, as he gets chance to beat a top 15 guy in his division. Guida has been struggling late against power punchers, and Peralta is definitely a power puncher. One thing to look out for is both these men switched camps for this fight. Guida moved his camp to Team Alpha Male and Peralta to Tristar. We could see a lot of improvement from both guys. This is basically a striker vs grappler matchup. Peralta has got to land big shots early, and stop Guida from leaning on him and taking him down. I think the training at Tristar is going to really payoff for Peralta in this fight. I think if he catches Guida early, he can finish him. Striking Advantage: Dudieva has a nice overhand right, but she mainly throws 1 or 2 punches at a time. Penna's striking isn't the best, but she stays in her opponent's face from the beginning of the fight. With that pressure and in your face style, she is able to land a lot of punches and mix her game up. Grappling Advantage: Dudieva was controlled rather easily on the mat in her last fight by Pena's teammate Elizabeth Phillips. During the 18th season of TUF, Pena dominated all of her opponents with excellent ground and pound and the ability to finish with submissions. Breakdown: This is Pena's first fight back since 2013 due to a severe knee injury. Dudieva basically lost her last fight, but due to a bad decision she got the nod over Pena's training partner Phillips. Pena should take this fight, but there may be some ring rust for a round. Once she settles in, I see her dominating Dudeiva quickly. Striking Advantage: Both of these guys have the same weakness. Chiesa has improved his striking, but he still isn't comfortable on the feet yet. He had success early against Masvidal, but faded late. Clarke is really stiff in his striking, and mainly uses it to get into grappling situations similar to Chiesa. Grappling Advantage: Both guys have really good chokes and majority of their wins come by submission. Chiesa throws himself into grappling situations and won't stop shooting for the legs until he gets a takedown. Clarke, on the other hand, doesn't necessarily look to initiate grappling all the time, but he is well versed when the fight gets there. Both guys have a submission win over a Al Iaquinta. If I had to pick I would give a slight advantage in submission ability to Chiesa, but Clarke isn't too far behind. Breakdown: Clarke is coming off a huge upset win over Al Iaquinta, in which he put Al to sleep via brabo choke. Chiesa is coming off a tko loss due to a bad cut vs Joe Lauzon. I think Chiesa is going to really be aggressive this fight. Loosing 2 fights in a row at 155 is a big setback for the TUF winner. Clarke should know what to do in this fight, considering that Chiesa is fairly one-dimensional. Chiesa likes to shell and cover up when big shots are being thrown, but Clarke doesn't have that type of power to intimidate him. This is as even of a matchup as it gets at 155, and the winner should get a step up in competition. Prediction: Chiesa via 3rd round RNC. Striking Advantage: Iaquinta has made huge leaps in his standup game since being a contestant on TUF 15. He has got big power and is getting more and more confident standing and trading punches. Masvidal, on the other hand, is a sound, crisp, and technical striker. He possesses some of the best hands at 155 and can fight from either the southpaw or orthodox stance. Masvidal has the tendency to start slow in fights, which means Iaquinta could catch him early. Iaquinta has the tendency to drop his hands at times as well. All in all Jorge is the overall better striker. He has better punches, kicks, combinations, and just mixes it up better. Grappling Advantage: Iaquinta's weakness so far in his career is dealing with submissions as all of his pro losses have come by submission. He has very good wrestling, but when on top he has the tendency to get comfortable and make mistakes. Masvidal is a very underrated grappler and shows how slick his transition and scrambling ability is consistently. He submitted Chiesa, and outgrappled tough guys like Pat Healy, Tim Means, and Cruickshank with rather ease. Breakdown: This is a very important fight in the 155lb division. With a lot of the top 15 guys coming off losses, the winner of this fight puts himself in prime position for a big fight. Both guys have similar styles, but I think Masvidal is a tad bit better everywhere. Iaquinta is also taking this fight on short notice after finishing Joe Lauzon. Masvidal has been frustrated with his lack to big fights considering all of his experience and success in his career. Masvidal wins most of his fights by decision, but in this fight he needs to make a statement and show he is one of the best at 155 that I believe he is. I think Iaquinta is a future star, but I just think Masvidal is so hungry to make a statement. I don't thin there will be so much strategizing this fight either, I feel like both guy believes he is better everywhere. Striking Advantage: This is really interesting. We know Mendes has big power in his fist and a steady improving standup game. Lamas is a underrated striker that has excellent timing on the feet. During Mendes' second run towards a title shot he finished a lot of guys, but that was against non-elite guys that lacked in the striking department. I would say Mendes is the better puncher, and Lamas is the better kicker. I give a slight speed advantage to Mendes, but I think Lamas has better movement. Its tough to pick who has the edge, but I slightly give Mendes the edge due to more power. Grappling Advantage: We first got to seriously see how good Lamas' ground game was when he submitted Cub Swanson and he later solidified that by outgrappling Hatsu Hioki when Hioki was supposed to fight Aldo for the belt. Mendes trains at Team Alpha Male, and pretty much every fighter on that team has great scrambling ability and good chokes. Besides Aldo, no one at 145 has been able to consistently give Mendes any kind of trouble on the mat, but Lamas is good enough to nullify him. Both these guys rarely ever work off their backs due to their superior wrestling ability. All in all, Mendes has better wrestling and poses more of a threat. Breakdown: This is a huge fight for both guys, as these guys desperately want to either get a rematch with Jose Aldo or settle their beefs with Connor McGregor. Lamas is coming off a great submission win in Mexico over Dennis Bermudez, who was really close to a title shot at the time. Mendes is coming off his disappointing loss to Jose Aldo, but he walked away with a tremendous amount of respect for his performance. I think Lamas would rather look to keep the fight standing, and I do think Mendes is going to wrestle a lot in this fight to solidify a win and his hopes for a shot at McGregor if he beats Aldo. Lamas has a huge chance at a big upset, and a impressive win leapfrogs him to the #1 contender in my opinion. I think Lamas is super underrated and has a chance to win this fight. The key is too not let Mendes find his groove with mixing punches and takedowns, and keeping his back away from the cage. I think Lamas will have his moments on the feet, and actually rock Mendes, but Mendes will get the nod by utilizing his wrestling in late rounds. 1 unit on Stallings to win 1.20 units.